Even with new cafes that keep coming up in the city every now and then, we just never seem to get enough of them. I think we should blame the coffee shop trend on F.R.I.E.N.D.S. After all, what better way to spend a lazy day than by whiling your time away at one of these cute places, with a steaming mug of coffee and friendly banter? Well, unless you count great ambience and the bonus of a great view! That will certainly make heading to such cafes more appealing. So, go ahead, pick from our list of charming cafes whose menu and decor have won our hearts and time. Whether you decide to gorge on the all-day breakfast or sandwiches here or just sit back, sipping on a cup of hot chocolate, the cheery ambience, full of superhero art and merch at Cafe Down The Alley is bound to make you stay longer than you intended. Sip on a cuppa with the Justice League, or play a board game or few with your squad. The ambience coupled with the super reasonable rates, we could just sit here all day! 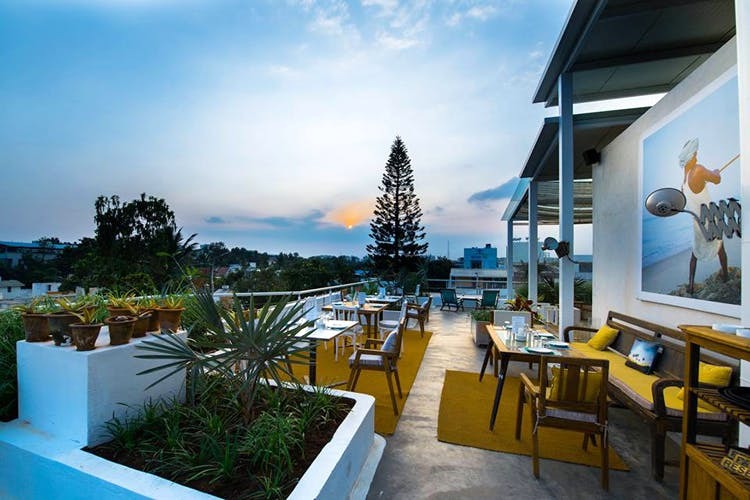 Rooftop seating with a great view, laid back vibes that channel Goa and soothing music in the background – you might never run out of reasons to head to Om Made Cafe. With quiches, sandwiches, burgers and creamy pastas to pick from, the space is just perfect for a Sunday brunch or even dinner on a breezy evening to watch the city lights. Built around an open courtyard and housed in Cinnamon boutique, Cafe Cassia’s simple yet appealing setup is great for when you want to catch up with your friends over a cup of coffee. Or even to just sit and work in peace for a while! With art on the walls and stores all around, don’t be surprised if you end up spending a whole day there. The focus here is healthy and fresh food. So, load up on the salads and sandwiches, and end with one of their desserts. Trust us on this, the food and set-up is very inspiring – both creatively and culinarily. Be it browsing through artisan Indian brands at Raintree‘s boutique first or just making a beeline to the cafe, this place is a mini paradise in the city. A relatively tiny space housed in the colonial bungalow, the place has an old-world charm to it. Pick a spot with a nice view of the (massive) garden outside, and sit back with your favourite book (no working allowed here). The limited menu here offers sandwiches, quiches, coffee and desserts to fill you up. We love that they let the kids loose here too! For feel good, rustic vibes, Fresh Pressery will have you breathing out all your stress, and tucking in to healthy and tasty treats. Sit for a gossip sesh over some tea with your gal pals after shopping, sip on one of their signature cold pressed juices. Their clean eating menu (they even have keto options) sits light and refreshing, just like their fcafe space, full of foliage and flowers. While The French Loaf has several outlets across the city, the one near Richard’s Park has to be our favourite. Located in a charming bungalow, the indoor seating has an almost homely feel to it, and the al fresco area is where you should make yourself comfy on cool, breezy days. Shaded by umbrellas and surrounded by trees and greenery, it’s much like sitting in a garden, while you enjoy your cuppa. While you’re at it, throw in a sandwich and a pastry (or two). Keep Odomos handy though. Designed much like an old Kerala house, Dyu Art Cafe is known just as much for its amazing ambience as for their food. Think open courtyards, gabled roof, oxide flooring and cemented seats, all adding to the quaint charm of the cafe. Of course, artworks on the walls to gawk at while you sip on a cup of Cafe Mocha or Cold Coffee, adding that eclectic touch. We could spend many an evening here, lost in a book and savouring the pleasant vibes of the place. Read more about it here. Apart from the sarees, jewellery, fusion wear and home decor here, what we love about Ambara boutique is the delightful cafe in their garden. Wicker furniture, checkered tablecloths and plenty of potted plants make it cute and charming. While you wait for your order to arrive, look around at the wall art, the handiwork of students from Srishti Institute of Art, Design and Technology. Too confused about what to order? We love their Spaghetti Carbonara and Grilled Fish with Salsa, along with a cooler to wash it all down. Read more about it here. A relatively small, unassuming place, tucked away near Tim Tai, Cafe D’Hide is one of our favourite haunts. With its white and green theme, exposed brick design on the walls and shelves holding small potted plants and jars, the place is pretty enough to lure us in every time we pass by. Even if it’s just for a cup of their Hot Chocolate or for devouring their Seafood Pizza. Know about pretty cafes we should include in this list? Tell us in comments.